A horribly transfigured Jeffrey Spender purposefully sheds doubts over his identity — and over if he’s Mulder himself — breaks in the X-Files office and tries to gain the trust of Scully, Doggett and Reyes in order to reach William. He injects William with magnetite that rids him of any alien influence on his biology. Yet for the aliens William will always be their prophecised leader, so in order to protect his identity Scully resorts to giving William up for adoption. With the final stretch of episodes, David Duchovny returns (for directing) and the promotion campaign makes sure that everybody knows that — at the expenses of the two new strugging leads. Storylines are closed; after getting rid of the Lone Gunmen (9X15: Jump the Shark) and Doggett’s son (9X16: Release), we are getting rid of William. Written by Carter, Spotnitz & Duchovny, the episode plays heavily on, once again, Scully’s weepy feelings when she doubts whether the Breather is Mulder or not (exacerbated in the scenes where she examines him and they look close to kissing, and where the Breather is holding William and weeps). He is now heavily scarred beyond recognition (not unlikely the failed hybrids of 2X25: Anasazi and 3X10: 731). As to how he came to be experimented on in a Supersoldier program, a hint of an answer is given in 9X19-20: The Truth. He is aware of the general situation: “The conspiracy to keep the truth about aliens from the American public all but destroyed a few years ago has given rise to a new conspiracy in the government now by men who are alien themselves” — the Supersoldiers. However he doesn’t know everything; he says that the aliens’ plans is “to do this to you, to everyone” whereas we know that the colonization will be different (Fight the Future) and the Supersoldiers are mere soldiers preparing the way (8X21: Existence) — unless he’s lying already to get the 3 FBI agents’ trust. 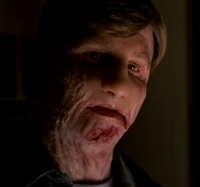 Spender profits from his disfigurment to shed doubts over who he is, he invents a story about him being in contact with Mulder and being there to “find answers” in files in the X-Files, the whole point of this manipulation being to reach William: “winning our trust was all towards one thing, it was only to get to William“. Jeffrey never saw Mulder, whatever he learnt — about the Supersoldiers, the magnetite, William — was through the tests he went through, probably by somehow sneaking into the files of the doctors that were experimenting on him. Jeffrey reaches to William and accomplishes his mission: he injects him with “an unknown metal“. After examination, the hospital doctor don’t find anything wrong with him, nothing but “an elevated amount of iron in his blood“. Jeffrey explains it’s “a form of magnetite“. This is the first time magnetite is actually referenced, but it’s obviously the same compound that causes the death of adult Supersoldiers (9X08: Trust No 1). Magnetite is an iron oxide (Fe3O4) that is actually quite common in iron ore found naturally on Earth; as its name suggests it’s highly magnetic. The form of magnetite Jeffrey refers to is most likely magnetite in a solution since magnetite itself is a solid ore that cannot be injected; the injected liquid has a silver colour, different from the red vaccine against the Black Oil. The iron in William’s blood is from that magnetite. Before the injection William is “part alien” and after this injection William is a “completely normal” human being. From 8X20: Essence we knew that William was conceived in a purely normal manner, and despite their past both his parents were entirely (genetically) normal human beings. Whatever alien part William had it came in after his conception. 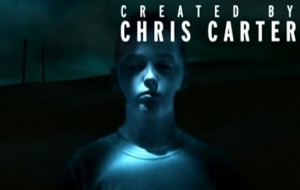 Indeed, through the tap water William was infulenced by the modified chloramine (9X01/02: Nothing Important Happened Today) while he was growing up, giving him alien capabilities such as telekinesis (moving the mobile). The chloramine, carrying a modified Black Oil virus, would have progressively modified his genome, slowly building up iron in the blood and forming that metal vertebra that would finish his conversion into a Supersoldier (an ‘organic’ Supersoldier). The fact that his blood could still be analysed shows that this iron buildup (a different form of iron than magnetite of course, 9X08: Trust No 1) was not yet in a very advanced stage. The injection of magnetite destroyed whatever alien presence was in his body: it’s likely that magnetite interacts electromagnetically with the iron and prevents any solid metal growth from conglomerating. Rather than killing the virus (which would make this injection a substitute for the vaccine for the Black Oil!) the injection stops the conversion before the vertebra can be formed and prevents the emergence of an alien conscience. The injection will protect him, it seems, forever from the chloramine’s influence: “They’ll always know what he was. They’ll never accept what he is” suggests irreversibility, a permanence in William’s ‘immunity’ to the chloramine’s effects. A long-term protection thanks to a single injection? This is not unheard of: heavy metals and radioactive substances, though at small doses, have a tremendous staying power in the human body; unlike most organic material that dies and is replaced throughout the lifetime of the organism, such material clings on and can be the cause for disease. The magnetite could similarly stay in William’s body and essentially protect him. And that’s what causes wrath to the aliens. After the injection, he no longer has any supernatural powers (the mobile above his new bed doesn’t move despite William’s attempts). Jeffrey calls this injection “a gift“. He believes that he has succeeded in taking William “away from them“, the aliens. Indeed, if the chloramine was to turn him into a Supersoldier and develop an alien conscience in him, automatically making him subservient to the Colonists, then the injection prevents William from ever becoming fully alien. The gift is free will: William will be able to choose between following the aliens or the humans. Again, the phrase “They’ll always know what he was. They’ll never accept what he is” suggests that with William, biology is not what is important — indeed biologically he was the same as all the other chloramine babies (9X08: Trust No 1). If biology is what made William important then Jeffrey’s injection would have made him totally useless to the aliens, yet “it’ll never be over“! William’s importance is symbolic, religious, shrouded in a prophecy that is set in stone; Scully was chosen to be the mother of their leader by one of the sacred Ships (9X11: Providence) and this cannot change. Biology is not important, what he stands for is. Despite anything that may happen to William, “your son is the one thing the aliens need“. The Colonists/Supersoldiers had left William in Scully’s hands because she was the most appropriate person to take care of him (and after all all her movements were under surveillance, see Trust No 1), the Supersoldiers have better things to do than baby-sitting. Jeffrey put an obstacle to the aliens’ plans, but they will still come after him to attempt to convert him to their cause — this time with more violent measures, perhaps to replicate him the hard, ‘non-organic’, way (Jeffrey: “Look at me, what they did. Is this what you want for your son?“). Scully is at a loss, she knows she can’t protect him. The only way William will be away from all this is if he becomes completely anonymous, if his trail is lost in the adoption procedures, which insure that the biological mother doesn’t have any contact with the adoptive family. (As an aside, given the extensive and thorough surveillance system presented in 9X08: Trust No 1, Scully wouldn’t be able to do anything, but that’s the typical author’s problem with a system so foul-proof that there is no escape to it; a narrative device that could eventually shortcut the whole plot is chosen not to be considered for storytelling purposes. Let’s just assume that the Shadow Man hadn’t been replaced yet and Scully was able to sneak William out.) Scully gives up William, who ends up being adopted by the Van de Kamp couple, apparently a practising Christian couple (“God has his reasons and his ways“) in a rural house in Wyoming. After the magnetite/kryptonite and the Supersoldiers/Superman, the unfortunate ‘Superman’ parallels continue: like Superman, William is an (ex-)alien baby that is adopted by a family in the heart of America. Fittingly enough, Wyoming’s flag is a white buffalo; white buffalos are also on William’s new handmade mobile. We are reminded of the events of 3X02: Paper Clip and the Native American myth of a white buffalo being the herald of great changes. Surely we haven’t heard the last of him: the 12-ish year old boy (2012?) in season 9’s opening credits is William!